MASO-INTERNATIONAL – Journal of the University of Veterinary and Pharmaceutical Sciences in Brno, Faculty of Veterinary Hygiene and Ecology in the Czech Republic. 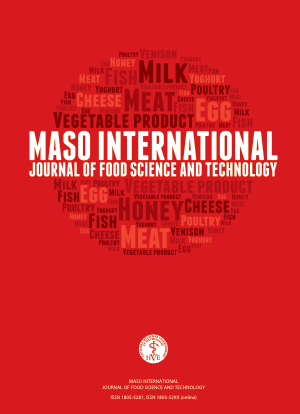 Maso International – Journal of Food Science and Technology is a journal of the University of Veterinary and Pharmaceutical in Brno, Faculty of Veterinary Hygiene and Ecology in the Czech Republic. This journal was launched by the Faculty of Veterinary Hygiene and Ecology in 2011 on the base of its maternal Czech version – journal Maso. It is published twice a year. It is mainly dedicated to the publication of the new research articles, findings and reviews in the field of Food Science and Technology. The goal of the journal is to reach the label of scientific journal with impact factor. The authors bear full responsibility for the contents of their contribution. The Editorial Board reserves the right to reject manuscripts that are not in the scope of the journal, or do not meet the requirements for publication. For information about publishing, see our Guidelines for Authors page and Publication Ethics. If you want to became author or for any questions, please contact the Editor-in-Chief (Contact section).